Home / Chinese Cuisine / Thiam Seng Seafood – At Last You Don’t Need To Spend $10 For A Shiok Hor Fun! Thiam Seng Seafood – At Last You Don’t Need To Spend $10 For A Shiok Hor Fun! The best hor fun for me was done without the use of eggs and with that delightful wok hei from the charred hor fun permeating through the gravy. Now it’s true that some hor fun with eggs thrown in can still taste fractionally shiok but yet most of the time, that ‘eggy’ flavor can be a little ‘disturbing’ because it masked away all those essential shiok flavors like the wok hei(if any) or flavours of any other ingredients like seafood or meat. 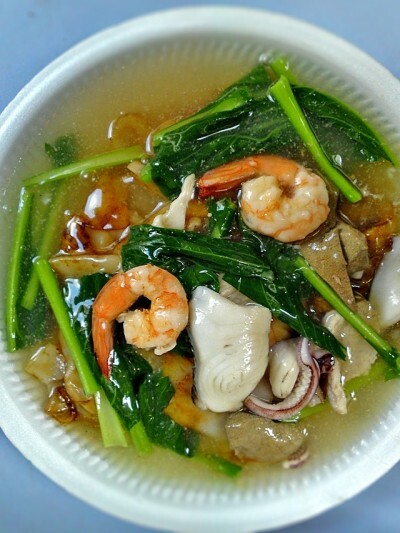 So if you are like me, someone who has always looked for nothing but the best quality hor fun available, you will be delighted to hear that I have found a really really shiok hor fun for just $3.50. Thiam Seng Seafood is a cze char stall at Old Airport Road Food Centre and most of the items on the menu here are priced reasonable from $6. 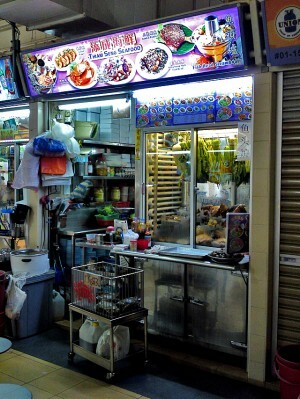 I have eaten at this stall a few times and some of the must try items are Oyster Omelette, Spare Ribs King and Cuttlefish Kangkong but that’s another story for another day. Today I’m going to tell you about the Hor Fun by Thiam Seng Seafood which in my opinion, is one of the finest plate one can find in Singapore for $3+. If you are really particular about eating hor fun that is freshly fried from scratch, no use of dark soya sauce, no eggs thrown into the gravy, then this will surely hit your umami very very hard. For $3.50, this should be considered very good value with generous portion of ingredients but the thing that sets itself miles and miles apart from the rest of the $3 pack is the wok hei. FWAH! The wok hei is so strong that I was even burping with it a few hours after eating it. It just taste like one of those things I need to pay $10 for and the gravy just happen to be very shiok too. As a matter of fact, the whole plate just resembles Fei Lao Seafood’s opeh leaf version. I would really have trouble differentiating the 2 if this were to have bigger prawns/sea cucumbers and served on the opeh leaf. I don’t know how much better a pack of $3 hor fun can get but for $3.50 at Thiam Seng Seafood, one can truly reap that kind of flavours that only exist when you have $10 in your pocket. 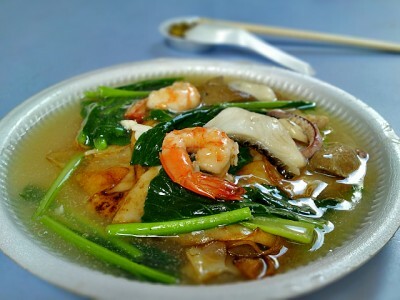 If you have not been tempted to eat an Opeh Leaf Hor Fun because it will make you $10 poorer, then this is something you must try because it has all the characteristics of what a shiok $10 Opeh Leaf Hor Fun should be yet the damage is only $3.50. Recommendation: Hor fun and other cze char dishes like oyster omelette, cuttlefish kangkong and spare ribs king(all only $6 each!). Conclusion: This is no doubt the best $3.50 I have spent for a plate of hor fun. No eggs used, translucent gravy, strong wok hei, plenty of seafood and pork liver used just mean that it is technically Fei Lao’s type of hor fun but with no-frills ingredients(no king prawns or sea cucumbers). Likes: Strong wok hei, delicious gravy and generous amount of ingredients. Dislikes: Portion a little small.